Following pressure from other businesses in the City of College Place, the venerable Walmart has decided to follow suit and close its doors Friday afternoon, to reopen on Saturday evening. College Place, built around the Seventh-day Adventist Institution, Walla Walla University, has been long known for businesses closing their doors on the Adventist Sabbath. While other unique aspects of the town, such as the difficulty in finding a caffeinated soda or beef jerky have faded, Saturday now seems to have gained some traction. "It gives our facilities a chance to rest," says Store Manager, Warren Wimple. "We also didn't feel that it was fair to other businesses in the area. Besides when you look at the recent economic climate, keeping our store open 24 hours and 7 days a week has become a luxury." We interviewed a local businessman, who preferred to be called Andy. He had this to say, "This is a strongly positive and unexpected step for a large company like Walmart. We praise their actions to keep College Place as free of distractions as possible while people should be in church." Many of those we interviewed were incredulous, "What a crock!" said Mr. McDonald panhandling in front of the store. "What am I supposed to do? Hold my sign in the church parking lot? Are you kidding?" Despite several angry responses Mr. Wimple responds, "customers will have to prepare for the weekend on Friday or wait until after sundown." Next, I cut a 120V to 12V E shaped core "filament transformer" about the size of my fist in half, to produce two separated E shaped iron cores. Cutting through all the copper windings, paper and iron core made a real mess, took a lot of time to cut and dulled my hack saw. I used a vice to keep the core slices from separating. I next wound the core with about 200 wraps of transformer wire I got at Radio Shack (I used the entire spool however many wraps that was). Clear plastic tape was used to keep the windings in place. I used a small piece of 220 grit sandpaper to take the enamel off the ends of the wire. I checked the inductance with my wavetek multimeter and it showed .3 mH. The resistance showed 3.3 ohm. The reason I am worried about this is that I don't have extra 20A fuses for my meter and I want to get an estimate of the quiescent current of my transformer without blowing up my circuit breaker, my meter and myself. This doesn't look good for my meter fuse or my breaker! After further thought about the way a transformer works and electric versus magnetic circuits I determined the following. The small quiescent current of a power transformer is a function of the reverse magnetic field produced by the voltage impressed on the secondary windings and not on the inherent impedance of the coil. When the magnetic field is broken (with an air gap) in a transformer it behaves like a shorted secondary and draws potentially lots and lots of current. For this to really work well, a higher frequency should be used. I'm curious what my toothbrush uses. Breakthrough discovery! I just hooked up my handy dandy yet old as dirt Freq Counter to that inductive coil and viola! 21 kHz and change. I need a higher frequency source than 60Hz. I have a function generator, but it tops out under a single Watt power output and has a 50 ohm output impedance. Higher impedance means more coil wraps... no good. I discovered that an old audio amp I have laying around will put out 50W up to 70kHz at 8 ohm output impedance. I think I will choose 20 kHz however. Higher frequencies may cause extra loss in the rectification process later. The coil inductance that I need to produce more than 8 ohms of impedance at 20 kHz. More Math: Z = j*2*pi*f*L Z = 8j ohms L = Z/(2*pi*f) f = frequency = 20,000 Hz pi = 3.14 L = 64uH This is definitely more reasonable. In fact I may try and wind this around a plastic core. ESN's are an 8 digit hexidecimal number or an 11 digit decimal number. Either one represents a 32 bit binary value. Keep in mind that one digit of HEX equals 4 binary bits. The Manufacturer Code is E6 (hex) or 230 (dec). The Serial Number is 9F FF FF (hex) or 10485759 (dec). The Manufacturer Code is 230 (dec) or E6(hex). The Serial Number is 10485759 (dec) or 9F FF FF (hex). Tired of the boring steady blink? Sport a blinker that will get the attention of any old school ham radio operator! Check the Youtube video of the action. This is my first project using an AVR microcontroller and really the first embedded systems project I've done since college. I had two options for programming languages C and assembly. 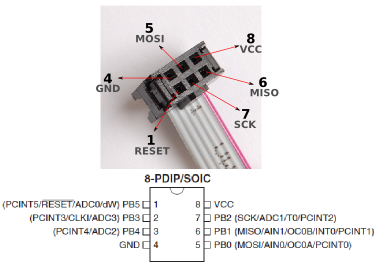 I chose assembly because I was familiar (at least with the 8051) and because it is well documented in the datasheets. Another advantage of assembly is the ability to know exactly what is going on especially when using a device simulator. Step One: Install the USBtinyISP Drivers. I've found the LadyADA writeup to be quite adequate. Step Two: Install WinAVR. This Ladyada writeup is also worth a look. Step Three: Install AVR Studio 4 (requires registration). Don't bother to install the Jungo USB Driver. Step Four: Write your program in AVRStudio. Give your project a descriptive name and choose a folder. Remember the folder name, you will need it later. Choose a debug platform, if you aren't sure use AVR Simulator. Choose the target device. ATtiny85. Copy and paste the code below. If you're brave feel free to tweak it a little. Press F7 to compile the code. Check out the The Engbedded AVR Fuse Calculator. Choose the ATTiny85 AVR Part. (There is no ATtiny85v option). A slow clock requires less battery power. Check "Serial program downloading (SPI) enabled; [SPIEN=0]"
All other's should be unchecked. Brown-out detection should be disabled. Forgetting to check serial program (SPI) enabled. (Chip is bricked). Step Six: Breadboard the programmer and microprocessor. Set the processor on the breadboard across the channel. Press the pins into the breadboard by gently pressing on the processor. Use #22 solid wire to connect the pins on the processor to the ones on the programmer's 6 pin cable. Keep in mind that your processor may have a dot above pin 1 rather than the notch shown. Open Dos and change to the folder your project resides in. type: avrdude -p attiny85 -P USB -c USBTINY -U flash:w:my_project.hex -B 10000 (the -B 10000) slows down the programmer for the slow clock speed. This is much easier to do on the breadboard to get started. In this case I mounted the whole deal to a Fi'zik - Saddle Attachment system. ;The Following instructions and "nop"s are for handling interrupts. reti ;return from any other interrupts that might be thrown. They are not important. rcall dah ; this produces a time delay long enough to handle switch bounce. pop r20 ;pop the old program counter from the stack. It isn't important. R20 is a convenient place to put it. ;The momentary button is connected to DIP pin 8 (INT0, Port B Pin 2). It should normally be pulled up. ;The LED is connected directly between pin 3 (Port B pin 4) and Vcc. PWM replaces the resistor. ldi r22, 0x00 ; Tell the interrupt process that the light is currently off. ;A high in the DDRB means we will use the pin for output, zeros will configure the pin for input. ;Unused pins will be configured as outputs to avoid unnecessary interrupts being thrown. ;A high in the PortB register would enable the pull up resistor for an input pin. ;GIMSK is the global interrupt mask. ;5 SE - Sleep Enable (Page 39) Set right before power down and unset right after power up. ldi r16, 0x30 ;This is where the edge trigger for the interrupt and the sleep stuff is hiding. ldi r22, 0xff ; Tell the interrupt process that the light is currently on. push r16 ;Save previous contents of R16 to the stack. push r17 ;Save previous contents of R17 to the stack. push r18 ;Save previous contents of R18 to the stack. ldi r17, 0x00 ;r17 is set to 0 because it is decremented to 255 before the compare is done. ldi r18, 0x00 ;r18 is used as the 0 register to compare with because I opted to use cpse. cpse r17, r18 ;Compare R1 and R3 (always 0) if they are equal skip the next instruction. Make a Tin Foil Float on Air! I learned today at work that some light objects such as aluminum foil or balsa can be made into boat that will float on top of a gas, namely SF-6. SF-6 (sulfur hexafloride) is a gas that we use at work in circuit breakers to prevent arcs when the breaker opens under load. I found a pretty good video of it on the internet. The guys at work talk about accidentally breathing SF-6 and because it is much heavier than normal air, talking really low, the opposite of helium. Blend well, while blender is running, slowly add canola oil until desired thickness is reached. Mix in Parmesan cheese to taste if desired.